Ultra Isolation Transformer comes with a very special construction all types of electrical noise predominantly common mode noise is eliminated by this. Since it isolates primary and secondary and separates neutral to the ground on the secondary side, it can be used to create separately derived source to combat the current loops. High isolating materials with special shielding techniques attenuate common mode noise as well minimise transverse mode noise. They are specially designed for sensitive critical equipment like computers & peripherals, medical instrumentation, digital communication telemetry systems, CNC Machines etc. and stopping such disturbances generated by the noisy equipment load from being injected into the power line. 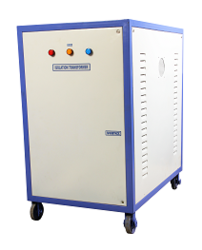 Nantech Power Systems, leading Isolation Transformer Manufacturer in Chennai, manufactures isolation transformer which is built with special insulation between primary and secondary and is tested, specified and marked to withstand a high voltage between windings, typically in 1000-volt to 4000-volt range. The transformer is utilized particularly for wireless stations and sophisticated medical equipment. It comes with low coupling capacitance. It is an advanced version of transformer supported by excellent shielding method with high noise attenuation apt for use as the power transformer. It comes in a wide range of operating voltages and high efficiency promising long life. The warranty ensures quick services and zero downtime. Switching of electrical utilities like Capacitors, MCCBs, ACB’s…etc. Larger the inductance of the system and larger the current change during switching, larger the magnitude of electrical noises. The inductive loads like big Motors, Compressors, Overhead Cranes, Elevators, Presses etc. also generates substantial switching noises. Switching equipments like Invertors, Converters, SMPS etc. generate electrical noises due to switching of Thyristors, Transistors, Relays etc. Welding systems pollutes earthing systems, adds notches and high frequency noises in the wave form, generating power quality anomalies. Lightening, precipitation of static charges and electrical discharges in the atmosphere are the natural cause of generation of various electrical noises. Electrical noises are observed to occur over a wide band of frequency ranging from 1 KHz to 100 MHz and above. In magnitude observed to be as high as 4000 to 6000 Volts on 3 phase supply system. The high frequency noise can interfere with digital electronic equipments causing untraceable data errors, change of programme, loss of memory, erratic behaviour,etc. The high voltage spikes can cause the failure of Thyristors or Transistor, Micro Processors and other sensitive devices. The radiated noise can interfere in operation of remote control equipment like Cranes, Digital Controls or Telecom Equipments. Protect Computers, CNC Machines and Telecommunication equipments from damage due to electrical noises, spikes etc. If ground potential of system units are different from each other and are exposed to the effects of instability at high frequencies. If ground of the equipment cannot be earthed. To shield large number of electronic equipments which individually are producing different types of electrical noise at a common busbar typically CNC machines, Drives, Hardening equipment etc. The use of NCT, being bidirectional, prevents damage due to circulating noise interference within them. When multiple Noise Cut-off transformers are used, the suppression effects increase in proportion. Therefore, the effects of cascading Noise Cut-off Transformers is remarkable.